It’s dense, asymmetric, the shorter side offers more precision and strength and drives the application benefiting from the longer side for blending. 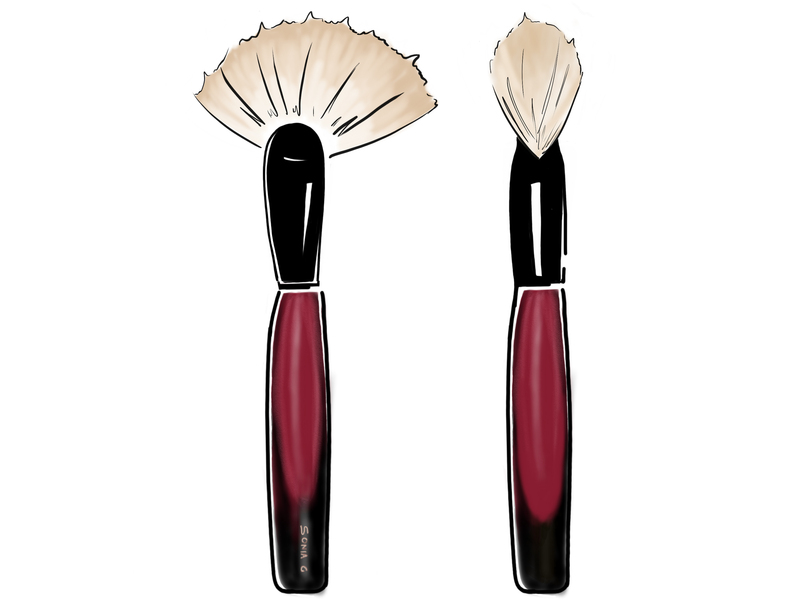 As a contour brush it will deliver a less defined application of contour compared to the Sculpt Two, but more defined versus the Sculpt One. It works with a wider range of products, from Rodial to Surratt to Denona or Inglot, however, the most powdery products would be better applied with a less dense brush -for example Sculpt One. If you are looking for a rainbow layered type of application to apply or blend the products in between them just where they touch. The shorter side allows targetting and pushing the powder around the corners of the nose or to be used as a puff. To blend and polish any edges or previous harsh application with precision. In any case the placement will be precise and polished and the usage is specific to certain techniques or products, even editorial make-up, always best paired with more harder products vs powdery formulas. All fans need to be used and washed a couple of times so that the bristles will reach their final position and feel a bit less tight, it won’t change much but it does make a difference. It is shorter on one side, the shorter side drives the application, a bit more versatile in comparison to the Sculpt Two, it can handle a wider range or contour products but still very precise and intense. The technique to contour is to start at the hairline and follow the cheeks (underneath) and give it a bit more structured, either straight or round type of sculpting. I’m having a hard time deciding among Sculpt One, Two, and Four for precise and easy contour application. I previously used a Nars Ita brush and liked the rectangular shape but found it unsatisfactory in all other ways. I’ve read your descriptions but still feel hopelessly torn in all directions. Any additional advice for the indecisive? Thank you! Hi! I am so sorry I did not see your comment in the queue! Definitely for precise contour either the Sculpt Two or Four, the Four is easier and allows a more versatile usage. What type of countour powders do you use? Hugs!! I have several brushes from you and they preform super. Now I have sisley gelee bronzer compact, Dior highlighter and Estee Lauder x Victoria Beckham highlighter, they don’t shown up with the Surratt highlighter brush. Wich one do you advice the sculpt 2 or the schulpt 4. I Just want a subtle glow. Thanks for your help. Dear Sonia, I know this brush is recommended for powder products but I was wondering since it’s undyed goat hair could it could also be used for cream contour and blush in stick format? (I’m thinking of the Westman Atelier products). I love them but have yet to find the right tool to apply them with!